Set in 1848, The Darkest Walk sees Detective Mendick on his first case. Evidence suggests the working class Chartist movement is seeking violent action after years of oppression. Mendick goes undercover in Manchester, heart of Britain’s industrial region and becomes embroiled in a conspiracy threatening to tear the country apart. 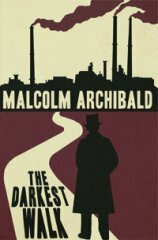 Former Dundee Book prize winner Malcolm Archibald was born in Edinburgh and holds a history degree from Dundee University. He has worked as a lecturer and in historical research as well as a variety of other jobs and has written several historical novels. He lives in Elgin with his wife Cathy. Gripping well written story, with deeper meanings too. I thoroughly enjoyed this book, I was unable to put it down. I must have posted this a million times at other places, but Darkest Walk of Crime is just one more book from an exceptionally skilled writer who has the unique ability to weave true historical facts into a fictional story and blend it all into a tale that is totally engrossing. Malcolm Archibald is a writer no one should miss out on. I only read this book after my wife 'suggested' I do. She insisted it was worth reading. After the first page I agreed it was reasonable. After the first chapter I liked it. After that my liking grew stronger: this book was brilliant. I am ex-army so I could empathise with Constable Mendick: I also tend to relate present experiences to my time in uniform. I hope there are more to come! Nice one, Malcolm Archibald! I love this author's work. His book is very interesting and exciting. His prose is excellent! When he describes a scent you can almost smell it. He builds a great story and delivers to the very end. A tour de force in crime fiction. I love historical stuff. I love strong men. I love fast action. I love intrigue. I love suspense. This book had all of these in spades. Not surprisingly, I loved this book. My primary interest lies in crime thrillers, but I thought I would attempt a Victorian detective story for a change. After all, who does not like Sherlock Holmes? This one was good: there was plenty of action, the scenes were colourful, the characters vivid and some of the action lurid; particularly when Armstrong attempted to roast Mendick in the chimney! The coach chase across England was beautiful and Rachel Scott a woman one would go a long way to avoid. This was a definite winner! This is the third of Malcolm Archibald's books I have read and the best. I liked Jennifer as a character because she was one feisty woman! A page turner from beginning to end; strong characters laced with believable history and an unforseen twist. What more can you ask for in a book? This is a brilliant book about a detective who infiltrates the Chartist movement on behalf of Scotland Yard. Don't let the fact it's historical put you off - it's a great, action-packed book and it has just been shortlisted for presentation to film producers at the Rome Film Festival in October 2011!